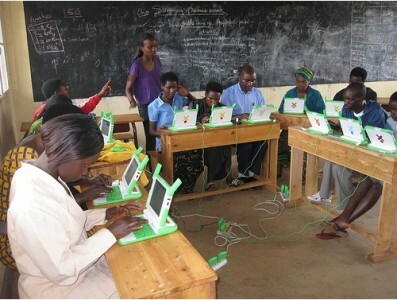 As we mentioned yesterday, OLPC Rwanda now has an excellent project summary (pdf) online. 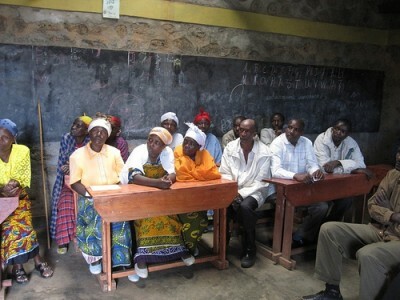 It covers the first three years of the national initiative and the related development of Rwanda’s primary schools. The report captures the spirit and challenges of country-wide change. It addresses the major phases of the project, and the background in government policy and vision, without diving into too much detail. In 2000, under the leadership of President Paul Kagame, Rwanda established 20-year objectives to transform the country into an industrial/service-based economy. This VISION 2020 plan specifies short-, medium- and long-term goals with measurable indicators of progress. The plan relies on six pillars, the second being human resource development & a knowledge-based economy, and three horizontal areas, the third being science & technology. In 2001, only one of the country’s 2,300 primary schools had any computers at all. By 2005, 1,138 schools had at least one PC, 40 schools in Kigali had Internet access, and connectivity was being rolled out to other schools. Over 1,000 teachers had been trained in computer literacy, from 120 primary schools. Rwanda announced in January 2007 it would work with One Laptop per Child. In 2008, it received 10,000 XOs [thanks primarily to our generous donors and the G1G1 program]. In early 2010, the government purchased 65,000 XO laptops so that schools in every school district could begin receiving laptops for P4-P6 students. This purchase was financed by the sale of cellular licenses to Tigo and Korea Telecom, working with the government to extend broadband connectivity nationwide. They have since purchased another 35,000 XOs, and plan to deploy another 400,000 over the next 5 years. Today the program has a 27-person core team, plus 5 staff from OLPC, working on the project. The Ministry of Education started with 150 schools, and asked the headmaster and a teacher of their choice to come to Kigali for one week of intensive training. They subsequently spent four days at each school to work with the teachers and students, and one day for community awareness meetings. Ministry representatives held meetings with local Parent Teacher Associations and local authorities, explaining how laptops would be integrated into the classroom. They also went on radio and TV and write newspaper articles to discuss the project. A recent report ranks Rwanda’s broadband connectivity speeds third on the continent, ahead of its neighbors in East Africa. This seems to be changing rapidly; I recall that just over a year ago, when we hosted the OLPCorps summit in Kigali, it was difficult for attendees to find hotspots to upload videos of any length. Rwanda keeps on surprising its neighbors. It intends to be an ICT hub for the region, and is moving in that direction full speed. Kudos to Kagame and his young crew for making that dream real, year by year. Rwanda aims to complete deployment of their next 100,000 children by next summer. National project coordinator Nkubito Bakuramutsa was interviewed this week for an article in the Irish Times. They discuss recent successes and policies at the Rwandan schools that have deployed the first batch of XOs in the country. Kagame and the teachers involved are both optimistic that they will transform their society into a leader in technology advances. Kagame aims to triple the nation’s economic output over the next 10 years.